Offline dictionary with images, made to be simple and powerful. 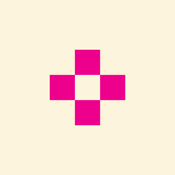 Dictionary+ interface is designed to really focus on content. The definitions are presented clearly, beautifully and can be navigated intuitively using gestures. When your device is online, Dictionary+ automatically search for images related to the words you are looking up. This may comes extremely useful, since "a picture is worth a thousand words." Dictionary+ can speak the words out loud for you, even when there is no Internet connection. 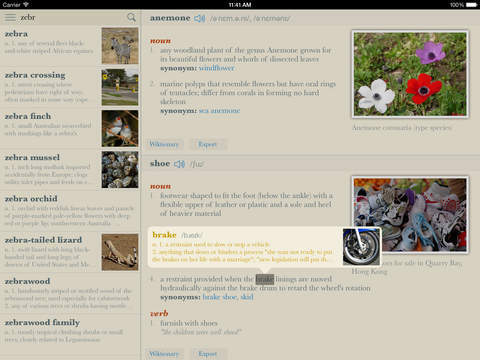 Dictionary+ is one of the fastest dictionary on the App Store. The search box is automatically selected at start up, allowing you to type your word immediately. Also, if you have copied a word in another app before switching to Dictionary+, it automatically looks up that word and presents the result. Dictionary+ uses data from WordNet, so most of the words come with examples, synonyms, antonyms, derivations. This makes it very easy to find and navigate to related words. And with the new inline look up feature, you can look up words used in definitions of other words with one tap. 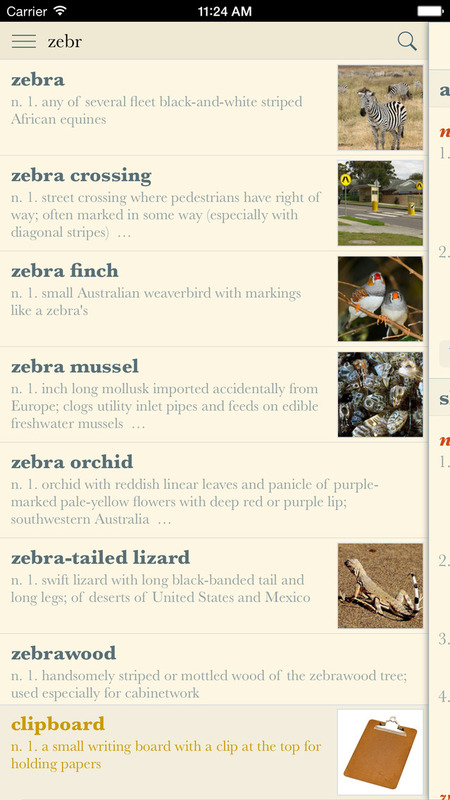 Dictionary+ is designed specifically for iPhone and iPad, so it is equally intuitive and beautiful on both.